Heat oven to 350°F. Grease 15x10x1-inch baking pan; line bottom with waxed or parchment paper. Grease and flour waxed paper. (Parchment paper does not need to be greased and floured.) Prepare cake batter as directed on package using water, oil and eggs. Fold in almond extract. Pour into greased and floured waxed paper-lined pan. Bake at 350°F. for 20 to 25 minutes or until toothpick inserted in center comes out clean. Cool 30 minutes or until completely cooled. While cake cools, toast almonds. Spread almonds on cookie sheet. Bake at 350°F. for 5 to 7 minutes or until golden brown, stirring occasionally. Cool. Run knife around edges of cake to loosen. Invert cake onto work surface. Remove waxed paper. Trim short ends. Cut cake crosswise into 3 equal layers. Place 1 layer on serving platter; spread with 1/3 cup of the orange marmalade. Top with another cake layer and 1/3 cup orange marmalade. Place remaining layer on top. In large bowl, combine all frosting ingredients except orange marmalade, adding enough half-and-half for desired spreading consistency and beating until creamy. Reserve 1 cup frosting for piping around edges. Add 1/3 cup orange marmalade to frosting; blend well. Frost top and sides of torte with remaining orange marmalade frosting. 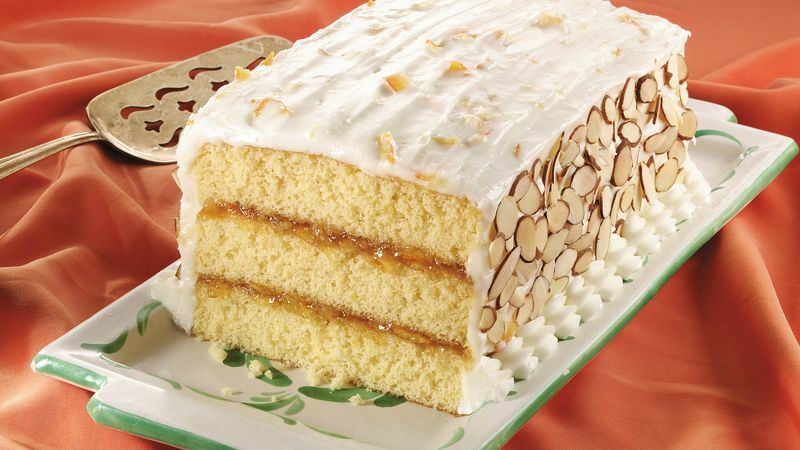 Press toasted almonds around sides of torte. Spoon reserved frosting into decorating bag fitted with large star tip. Pipe frosting around outside edge of cake top. If desired, garnish with strips of candied orange peel. Store in refrigerator.